Photo taken on Oct. 22, 2017 shows a snow leopard with its cub at Three-river-source National Park in northwest China's Qinghai Province. 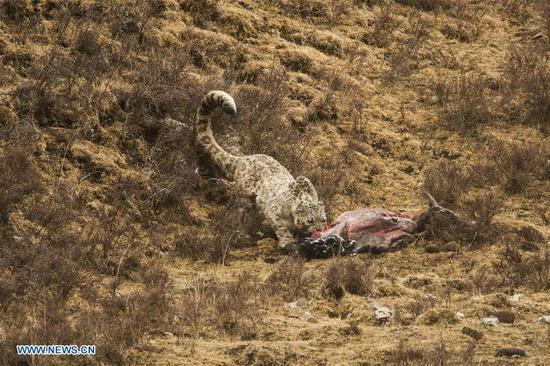 Photo taken on May 2, 2017 shows a snow leopard eating at Three-river-source National Park in northwest China's Qinghai Province. Photo taken on Oct. 22, 2017 shows two snow leopard cubs at Three-river-source National Park in northwest China's Qinghai Province. Photo taken on Oct. 22, 2017 shows snow leopards at Three-river-source National Park in northwest China's Qinghai Province. A snow leopard jumps in the snow-covered Xining Wildlife Park in Xining, capital of northwest China's Qinghai Province, on Nov. 7, 2018. 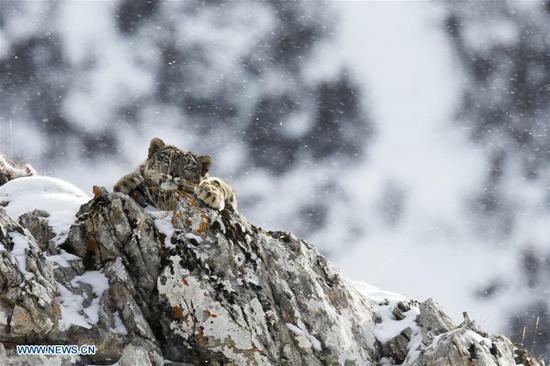 Photo taken on Oct. 26, 2017 shows a snow leopard at Three-river-source National Park in northwest China's Qinghai Province. 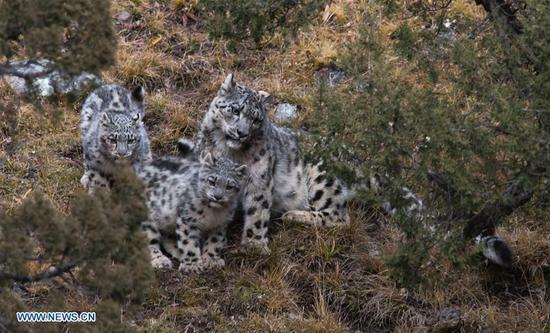 Li Yuhan can still vividly remember when she encountered snow leopards two years ago at Sanjiangyuan, meaning "source for three rivers," in northwest China's Qinghai Province. "I was with a scientific survey team, and we were heading toward a mountain top in Namsel Township of Yushu Tibetan Autonomous Prefecture," said Li, a student of Peking University. "I saw seven snow leopards on that single day." Li said it was a cloudy day, and the grassland was quite slippery. "We saw a snow leopard hiding behind a huge rock, feasting on a blue sheep," she recalled. When nighttime came as the group returned, they saw a female leopard and her two babies climbing up the mountain top right across where they were walking. 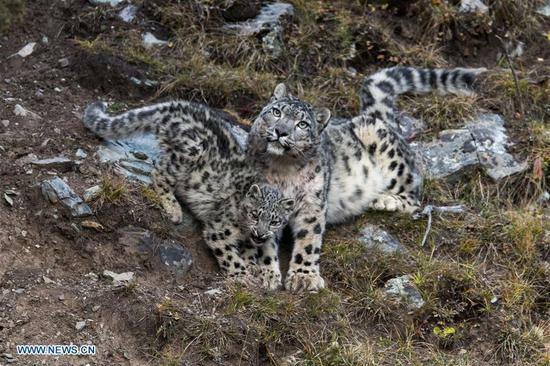 "The snow leopards' eyes were sparkling in green lights," Li said. "We were very excited because it was the first time that we saw snow leopards in the wild." The township of Namsel has an average altitude of more than 4,000 meters above sea level and forms part of the Sanjiangyuan National Park or the Three-River-Source National Park. Sanjiangyuan is home to the headwaters of the Yangtze, Yellow and Lancang rivers and many rare wildlife species. It has been dubbed "Asia's water tower." 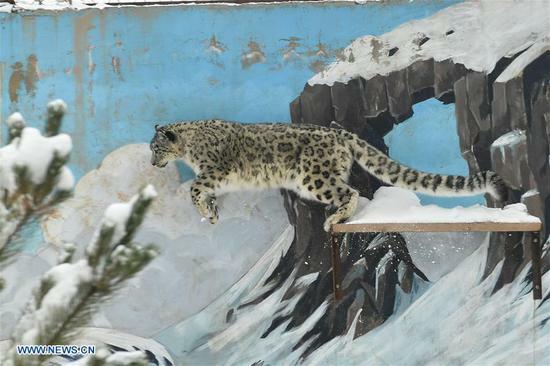 Snow leopards have been thriving in the Sanjiangyuan area thanks to government efforts to protect the wild animals and a crackdown on poaching. The latest figures show that more than 1,000 snow leopards have been found in the area. Tashi Dongdre, Communist Party chief of Namsel Township, said the township has more than 181,667 hectares of land, but the population there was just 8,471. So far, more than 100 infrared cameras have been installed in the township, with more than 80 local herdsmen joining hands with scientists in observing the wild leopards. "We have so far observed 40 snow leopards, and footage of the animals living, hunting, or mating have been collected for scientific research," Tashi said. 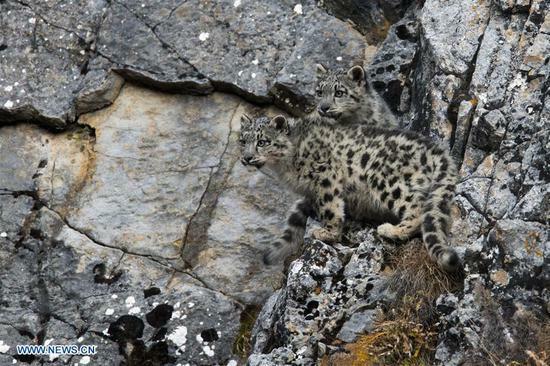 Authorities are building the Sanjiangyuan National Park to better protect wildlife there, including the snow leopards. The park, under construction since 2016, is set to open in 2020. "Building the park will help protect the biodiversity, and better protect the rare species here," said Jiu Xie, with the management bureau of the park. Since 2016, the population of wild animals such as snow leopards, brown bears and yaks in the area has been recovering, Jiu said. Snow leopards are a Class A protected animal in China and are classified as "vulnerable" by the International Union for Conservation of Nature. They live in the Himalayas in central and south Asia at an altitude of 2,500 to 4,500 meters.